“Do Something NOW your future self will thank you for!” is a quote that Quinn Conyers lives by whole-heartedly. Quinn brings an incredible energy into any room she enters; her strength and confidence shine brightly. Her positivity couples expertly with her practical and real-world approach to school, business and life. She radiates an air of knowledge, preparedness, know-how and happiness and passionately delivers her message of intense motivation and inspiration meant to empower all students to take charge of their college experiences and become dynamic and innovative leaders. As the Chief Fashion Officer (CFO) of the Purse Paparazzi, Quinn is the creative mastermind behind a bag business that specializes in providing large groups of niche women customized purses. In addition to being an entrepreneur, Quinn is a seasoned traveling speaker. She began her speaking career in college when she served as the commencement speaker for West Chester University’s Kente ceremony celebrating multi-cultural students who graduated from college. That experience jumpstarted her desire to speak, which also lead Quinn to start her own speaking firm, and co-found a speaking bureau. Quinn has spoken at University of South Florida, Morgan State University and Syracuse University, to name a few. 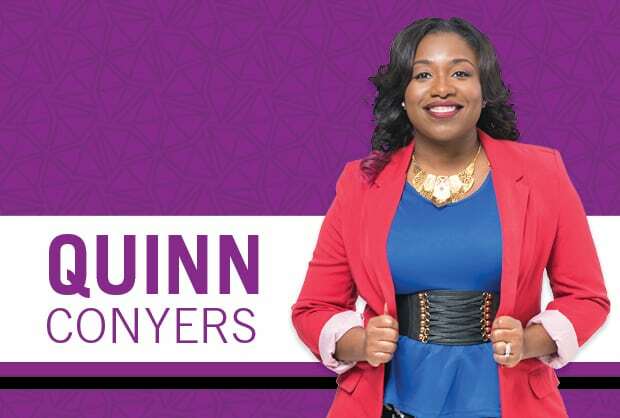 As a result of Quinn’s entrepreneurial ventures and speaking accomplishments, she has been featured in several local and national media outlets including Young Money, Essence and Black Enterprise magazines. Quinn holds a Bachelors Degree from West Chester University in Pennsylvania and a Masters degree Howard University in Washington, DC. She currently resides in Baltimore, Maryland with her husband and baby boy. Quinn’s ultimate goal is lead a global bag business, speak at colleges nationwide, host a talk show, and host LIVE events in convention centers. Often on a college campus students are pushed into leadership roles (willingly or unwillingly) but don’t have the skills or leadership style to be successful. This can lead to frustration in a leadership role or worse a student withdrawing from the group or leadership position entirely. In Master your Leadership PITCH, Quinn Conyers encourages students to explore, experiment, and discover their personal brand as a leader. In this interactive and engaging keynote presentation, Quinn helps colleges students identify key components about themselves so they can be effective in the leadership role they are currently in or considering. Nearly 57% of students enrolled in college are female, many of which hold leadership roles in campus clubs, organizations and associations. Unfortunately, they often find themselves feeling unfulfilled, stressed or overwhelmed without anyone to turn to for support and guidance. Finding a balance in life between academics, work, clubs and friends can seem nearly impossible at times. Lady leaders frequently aren’t appreciated for the work they do for clubs or organizations and rarely get the academic feedback they need. They are left feeling as though their heads are barely above water with everything they have to juggle. As a resident assistant, peer mentor for two organizations and member of the Black History Club, Quinn Conyers knows first hand how to lead like a lady! Through years of trial and error, she’s learned how to balance academics, extracurricular activities and a social life like a champion. Her expertise and advice will empower your leading ladies to do the same. In this action-oriented keynote, Quinn inspires college women to DO, DELEGATE, and DREAM! She arms women with the tools they need to command their lives and careers. Quinn pushes lady leaders outside their comfort zone, challenging them to lead by example, ask for help when they need it, and go after the job or business idea they’ve always wanted. This motivational and inspiration keynote is perfect for lady leaders, collegiate women’s conferences and women’s college clubs. how to balance academics, extra-curricular activities and a social life. Roommate conflict, dorm room parties and community hygiene are only a few areas that Resident Assistants (RA’s) deal with on a daily basis. How do you be fair, but also be an enforcer of student housing policies? And how do you balance a life outside your student leadership position? Many RA’s often get overwhelmed, asking themselves, “is this really for me?” or “will I ever get a day off?”. In this powerful keynote exclusively for student leaders in RA positions, Quinn Conyers shares relatable advice on how to deal with situations that are frequent in residence life and housing. As a Resident Assistant (RA) 3 out of her 4 years of college, Quinn successfully mastered the RA and student life world. Going to class, managing a floor of 240 coed students, AND keeping up with a social life was Quinn’s day-to-day reality. She held the record for the most students attending her monthly educational programs and had the lowest number of roommate change requests to date! Quinn gives RA’s the tools they need to succeed, including: several strategies to balance their life as a student housing leader, techniques for handing student conflict, and ideas on how to increase student program participation. The program is specifically tailored for Resident Assistants or others holding a similar position. balance, dealing with difficult students, and staying motivated. Multiple ways to communicate with diverse students and peers. How to implement easy strategies to increase student program attendance. Strategies to handle roommate conflict, issues, and concerns. How being an RA translates into awesome job-related skills. Freedom, finances and new friends can make or break you going into your first year of college. As a matter of fact, 1 in 3 first time college students will NOT return for their sophomore year. Many students are well aware college is an opportunity of a lifetime, but often lack the guidance, family support or discipline to be successful. Quinn Conyers is here to give first time college students a heads-up as someone who has been in their shoes not once, but twice. She presents them with a life-changing message that will help them maximize their college experience from day one. In this powerful and thought-provoking keynote, Quinn enlightens first year college students on how to navigate campus life. She encourages students to be active, authentic and alert on campus. Quinn engages students through real life examples on how to be a stellar student beyond getting good grades. This keynote is particularly appropriate for Historically Black Colleges & Universities (HBCU’s), Hispanic Serving Institutions (HSI’s), 2-year institutions, 1st time, and 1st generation college students. various ways to transition from a high school mindset to a college mentality.